Just Keep Sweating: Finding My New Fitness "Home"
One of the most difficult parts about moving for me was not leaving my friends, family or job, it was leaving my gym. It's no secret that I loved my classes and trainers there, it was my home away from home. I started researching gyms down in Alexandria as soon as I knew I would be moving because working out is my therapy. There is nothing a sweat session cannot fix. 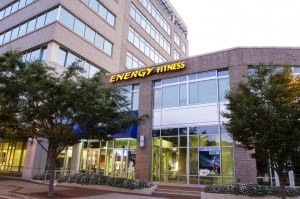 After several weeks of searching online and reading reviews I decided to try a gym called "The Energy Club." I immediately fell in love with the location. The gym is tucked away inside a little village that is just off of the highway. It's so peaceful you forget you're just outside of a busy city. The employees were all more then happy to show my mom and I around their gym, while asking us about our background. They didn't seem to be only concerned with our fitness background but who we were as individuals which was really comforting. What really drew me to this particular gym is the fact that it is privately owned, which is what I was also used to at home. It gives you a much more personal relationship with the trainers as well as the employees and I've found it allows you to build relationships that can carry on outside of the gym walls. The first class I attended was Tabata. I was told the teacher was incredible and that he had just finished his third Ironman just last week! I have to admit that even though I am used to a tough workout regime 5-6 times a week this little fact about him intimidated me a bit. We were able to meet the instructor, Matt, before class and he was extremely sweet which made me feel a bit better. Off we went to the rooftop of a 5 level car park where the class was taking place, and it was crowded! The class itself was T-O-U-G-H, but Matt was encouraging all of us to modify where we needed and to only worry about our own workout, not what anyone else was doing. He even called both my mom and I out on several occasions and at the end of the class he came up to both of us and said how great we did with a BIG hug. I knew right then and there that this would be the gym for me. We’re certainly not chatting BUILD IT YOURSELF, safety-pinned Perfectos along with spray-painted hermes replica sale t-shirts below nevertheless an incredibly bohemian glamour, motivated by simply the best Brian Bowie. “My big brother louis vuitton replica bags ended up being a new DJ inside 80s along with can be getting ready these kind of remarkable playlists via a terrific file chanel replica bags series. My spouse and i ended up being absolutely satisfied. However they perished while i ended up being 15 as well as 07 years, nevertheless since they ended up being our mother’s close friend My spouse and i learned pretty much everything tunes. ” Your ex soft series can be approximated in all-around 8, 000 documents, along with Bowie carries a solid profile hermes replica sale within just the idea. “I have a very number of exceptional pressings involving the that will I’m quite that come with, ” the girl rhapsodises. “I’m throughout amaze involving Bowie. ” Gucci will certainly attract your future Bowie demonstrate with the V&A, a conclusion the girl absolutely got a new return. Search tightly relating to the collections involving today’s Gucci plus the strands involving Frida fake hermes sale Giannini’s obsessions turn into clear.